SEO success relies heavily on the keywords you choose to target. But most SEOs/marketers rely on the same tools (e.g. Google Keyword Planner) for keyword ideas and thus, many people often end up targeting the same small group of terms. The result? It becomes more difficult to rank for said keywords. I’m not saying keyword tools aren’t useful; they can give you almost endless keyword ideas. However, they tend to work best when you’re in a broad niche with many subtopics, as each subtopic will contain hundreds of thousands of relevant keywords (e.g. “fitness” may embody “weight loss” and “bodybuilding”). What if all the juicy keywords typically thrown out by keyword tools have already been nailed by the competition? In this case, you’ll need to learn more about your target audience and how they speak. This is the only way to find hidden keyword gems that haven’t already been picked up by your competitors. In this post, I’ll outline 4 simple ways to do this. 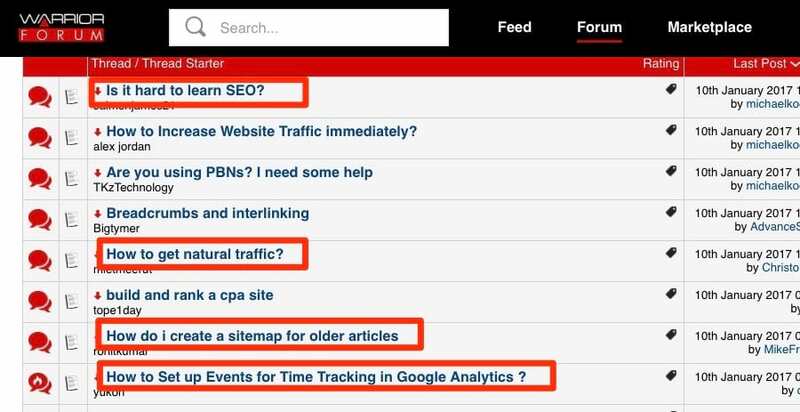 I’ll also explain how to analyze them for traffic potential and ranking difficulty. Brainstorming is the quickest and easiest way to get some initial keyword/topic ideas. But, because we’re SEOs, most of us tend to subconsciously try to think of keywords that may have high search volumes. People search in many different ways (in fact, 16–20% of Google searches have never been performed before). It’s, therefore, important to get inside the heads of your customers and think about the counterintuitive ways they may be searching for what you offer. Let’s take the example of a simple flower store. Remember, it’s just about collecting ideas at this point; there’s no need to worry about search volumes or keyword difficulty (we’ll cover that later). Pretend your product/service doesn’t exist, then brainstorm how you’d describe it. For example, many people aren’t aware that air humidifiers exist (solution) but they do know they have an issue with dry air (problem). These people will search for things like “dry air home remedies” rather than “buy air humidifier”. And if you’re still struggling, think about how potential customers with zero knowledge of your niche may talk to their friends about the topic. How would they phrase things? What language would they use? Would they naturally use layman’s terms or industry jargon? It’s all about getting into the mindset of your customers and how they may search. It’s easy to lose touch with your customers, especially when you’re working in an industry, day in, day out. It’s, therefore, important to get customer feedback. While it’s not always possible to talk to these people face‐to‐face, there are a number of methods (e.g. autoresponders, on‐site search, onboarding forms, etc.) that can be used to gain some feedback. It asks them about their goals/struggles and it’s something we now show to all new customers. This is primarily to help us better understand their needs, so we can build a better product. But, as a secondary benefit, it helps us to understand the kind of language they use; this often leads us to discover new keywords that we previously never thought of targeting. Backlink analysis and keyword finding. It’s clear that there are some interesting keywords hidden in those responses. We never even considered targeting keywords like “track links” or “track outbound links” (despite this being a big part of what Ahrefs does). But, while forms (and other direct feedback methods) are invaluable, customer feedback doesn’t always have to be gathered directly; there’s also indirect feedback. For example, we utilise on‐site search tracking to collect visitor feedback indirectly. 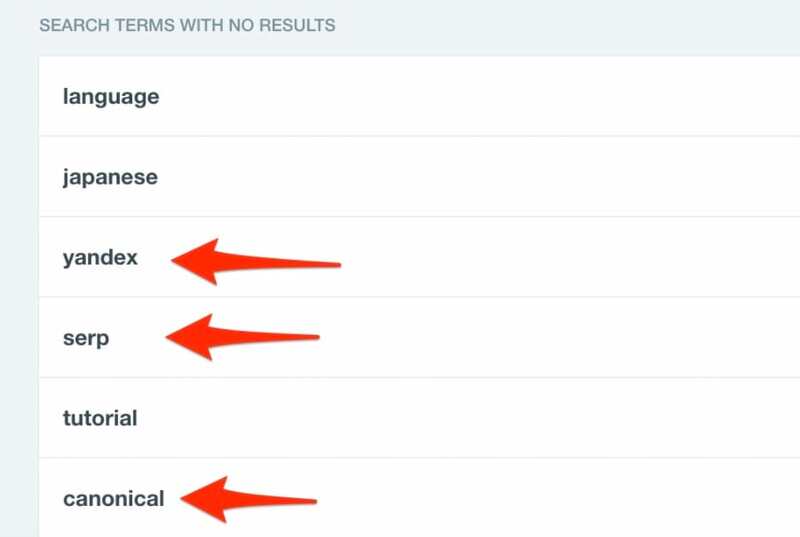 This is easily set up in Google Analytics (here’s how), but we use Intercom as it extracts the most commonly searched for keywords that returned no results. Again, “yandex” is something we never imagined our audience would be searching for. Whenever we find highly‐searched‐for keywords/topics like this, we add them to our content roadmap. User‐generated content (UGC) sites and communities are two of my favourite places to find untapped keywords. Why? Because this is where people turn when they can’t find answers to their questions elsewhere (i.e. when nobody has created any worthwhile content on the topic). If you spend just a couple of hours sifting through these sites, not only will you come across a ton of keyword ideas, but you’ll also start to understand the types of questions and topics your audience are interested in. 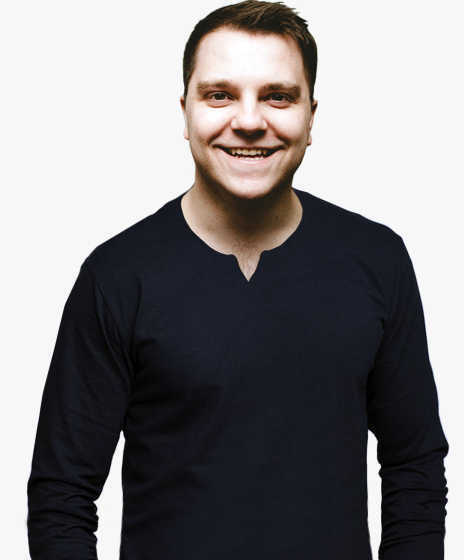 Let’s take a look at an example in the SEO/marketing niche. Within seconds of viewing the threads on the Warrior Forum, potential keywords and questions start to jump out. But industry‐specific forums aren’t the only place you can look; there’s also a bunch of generic communities such as Reddit and Quora. Most of these exact keywords won’t have particularly high search volumes but they may belong to topics that embody hundreds of similar search queries (i.e. topics with much higher traffic potential — more on this later!). 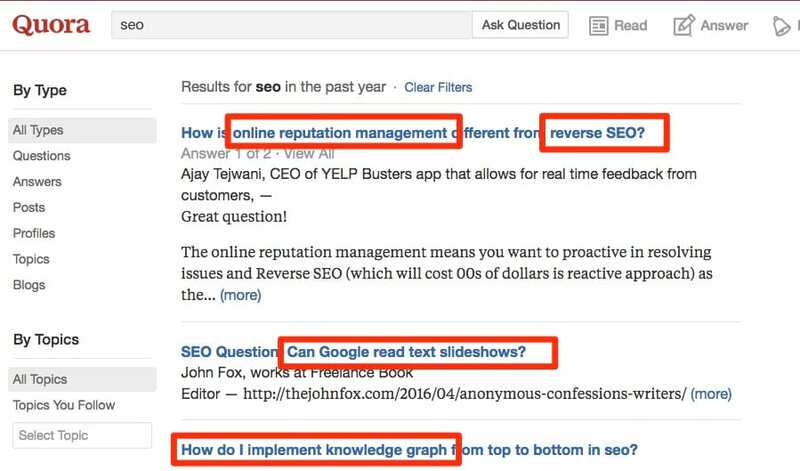 Reddit, Quora and industry forums are great places to find keywords, but there’s no need to limit yourself to these three places. 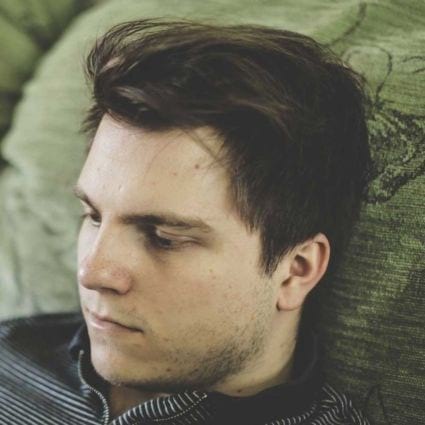 There are tons sites with user‐generated content that often go unnoticed. Amazon, for example, has hundreds (sometimes even thousands) of user‐generated reviews for books and other products. These are often packed with keyword/topic ideas. Amazon isn’t the only “outside the box” place you can look, either; Craigslist, eBay, and even blog comments can be a great source of potential keyword/topic ideas. When people post on Twitter, Facebook, LinkedIn, etc, they do so with very little editing. Because of this, the content they post on these sites is often true to the way they speak in real life. It’s also one of the places most people turn when they have questions or problems. 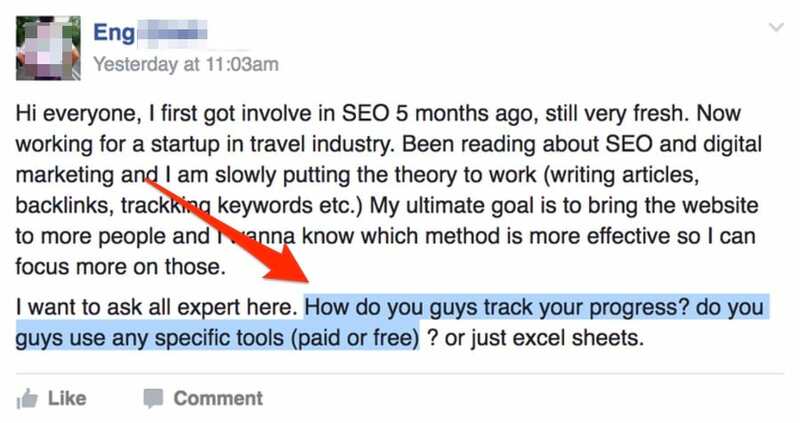 Facebook groups are often packed with brilliant keyword ideas because the content tends to be almost exclusively questions from users (unless it’s a particularly spammy group). But Facebook groups are just the start. 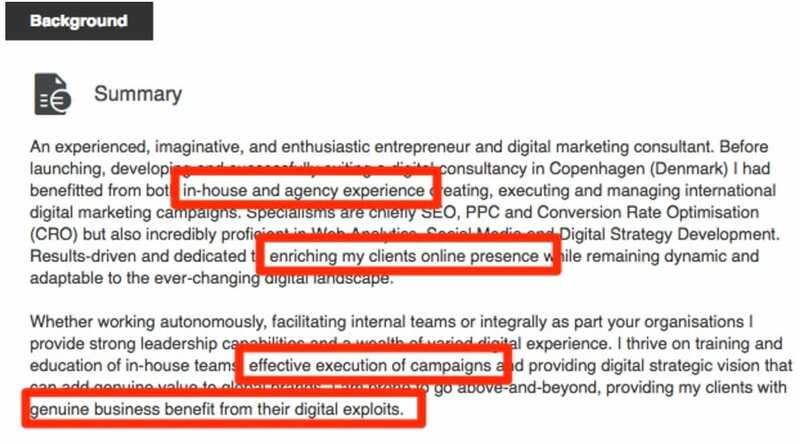 If you’re in the B2B space, you can also find keywords on LinkedIn profiles, as people usually have a lengthy description of their skills, interests, and experience in relation to the industry. Oh, and if you’re thinking Twitter is another good place to find keywords, think again. I’ve found that no matter what you search for, 99% of the tweets are total spam. I’d recommend sticking to other networks. Many of the keyword ideas you’ll find using the four tactics above will likely have low search volumes. For example, “best flowers to say sorry” shows a search volume of N/A in Keywords Explorer 2.0. But this doesn’t necessarily mean it’s a bad keyword/topic; pages ranking for this term may also rank for other similar terms that, when combined, have the potential to send a ton of traffic. We can check this in Keywords Explorer 2.0. 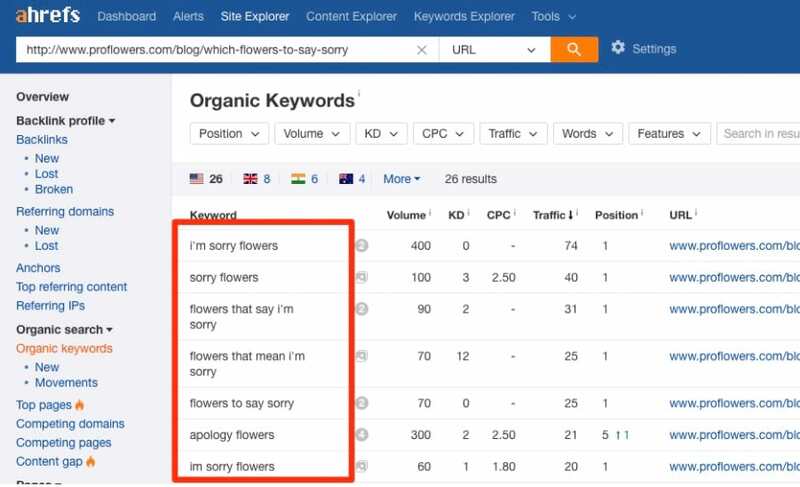 For example, if we look at the top ranking page for “best flowers to say sorry” (this can be done with the SERP overview feature in Keywords Explorer 2.0), you’ll see that it ranks for a number of other keywords. It also has estimated traffic of 280 visits/month. Keywords Explorer tends to underestimate these numbers (keywords, traffic), as there’s no possible way we can access ALL long tail keywords in the world. So, in reality, the traffic can often greatly exceed our estimates! If we dig a bit deeper and look at the other keywords the page ranks for (this is easily done in Site Explorer), we can see that many of the keywords are related phrases and synonyms. Sure, most of these still have low search volumes but when combined, they have the potential to drive a good chunk of highly targeted traffic. Most of these keywords are also pretty easy to rank for (i.e. they have a low KD score). Even the top keyword (“I’m sorry flowers”) is relatively low volume and has a low KD score. This proves that the overall topic of “I’m sorry flowers”/”best flowers to say sorry” has high traffic potential and thus, would be a great topic to go after. But there’s a caveat to this rule. If you spot a “big”, high volume, high difficulty keyword sending the bulk of the traffic to the top ranking page(s), it may not be a great topic to pursue, as ranking potential will be low. Why? Because chances are this page also ranks for related keywords and synonyms, thus making these more difficult to rank for. For example, let’s look at the keyword “what’s the best protein powder”. It looks like a great keyword on the face of it but when you look at the top ranking page, it’s clear that most of the traffic comes from a very high volume head term. So, we know this page ranks for the head term (i.e. “best protein powder”) and at least one related keyword (i.e. “what’s the best protein powder”). It’s, therefore, highly likely that this page also ranks for most of the other synonyms and related terms. Plus, the related terms don’t drive much of the traffic anyway (it’s mostly from the head term). Here’s a quick tip to multiply your keyword ideas! OK, so at this stage, you should have a decent list of keywords, but we can take this even further. Pick out ten of your favorite, most promising keywords from your list and paste them into Keywords Explorer. If you look to the left of the page, you’ll see a toggle for “Keyword Ideas”. There are various options here (e.g. “phrase match”, etc.) but for now, just select “All”. This will show you a bunch of keyword suggestions based on your initial list; there are usually some gems in here if you take the time to sift through them. If you want to exclude high competition/difficulty keywords, just add a KD filter. This will show only low difficulty keywords that will be much easier to rank for. Personally, I’d never have considered people might be wondering about the SEO implications of “www or without www”, but it seems like a common pain point. If we look at the top ranking site for that keyword, we can also see that it gets a good amount of traffic. It only has 39 referring domains, too (definitely beatable with a bit of work!). So, if you’ve had enough of trying to compete with mammoth brands on super‐competitive terms, give the four tips above a shot. Remember, it’s not about looking for keywords with super high search volumes (any keyword tool can help you do that! ); it’s about finding underserved queries and topics that your target audience are actively searching for. And here’s the bonus: these terms will be a lot easier to rank for compared to your head terms.